Fast-growing printer, Civic Media, also faced this challenged but tackled it head on by implementing the Fujifilm UVISTAR 5m Model. Before doing so, the company noticed construction site signage and banners were lacking high-quality imaging, despite the fact they used these signs and banners to attract new customers. Seeing a gap in the market, Civic Media began marketing its products as similar to point-of-sale quality and quickly found success. Civic Media grew rapidly, however, this growth created significant issues during production. The printer’s previous UV machines weren’t keeping up with demand – breaking down and costing the company a great deal of money on maintenance and downtime. In order to speed up turnaround times and maintain image quality, Director of Civic Media, Adam Middleton, decided it was time to upgrade machines. Civic Media decommissioned its four older printers, moving all jobs to the Uvistar 5m, and the company saw an immediate increase in productivity. Middleton commented that “A 400 metre job that used to take more than a day to print, now takes about 80 minutes”. The switch to a new system changed production dramatically for Civic Media, and the company is now able to fulfill customer requests at far more competitive speeds. Whilst the company initially found success with its high-quality offerings, it’s now finding success with both high-quality imaging and fast turnaround times. Middleton said, “Our output is so high, we can turn jobs around in days, instead of more than a week”, and with the time and money saved from this fast and efficient production, Civic Media is now expanding into new markets and moving finishing jobs in-house. 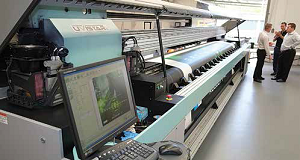 If you’re dealing with wide format jobs, UV Printing is certainly the most efficient option. UV Ink cures instantly, meaning the printing process is clean, efficient and much faster than traditional inkjet printers. If you’re looking to expand your offerings, UV Ink Technologies will allow you to print on media such as polyethylene, PVC and backlit film. Whilst many posters and signs are being replaced with screens, print still remains critical for billboards, fence signs and other super-wide venues. A state-of-the-art UV printer will allow you to remain competitive within the industry by offering more complete and affordable marketing packages. To ensure you are receiving the most up-to-date information about ultraviolet printing, subscribe by email to receive our future blog posts!